Congrats to tonight's Oscar recipients, including vintage actor Christopher Plummer, the statuette's oldest winner. It's never too late for any of us! And it's really never too late to take a gamble on Oscars. 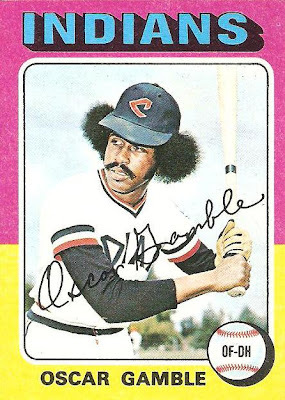 Known in the 70s and 80s as a solid hitter and fielder, Oscar Gamble's notoriety lives into the 21st century as a cardboard deity, thanks to some amazing hair and Topps' propensity for letting their art department handle details like "current team" and "uniform." 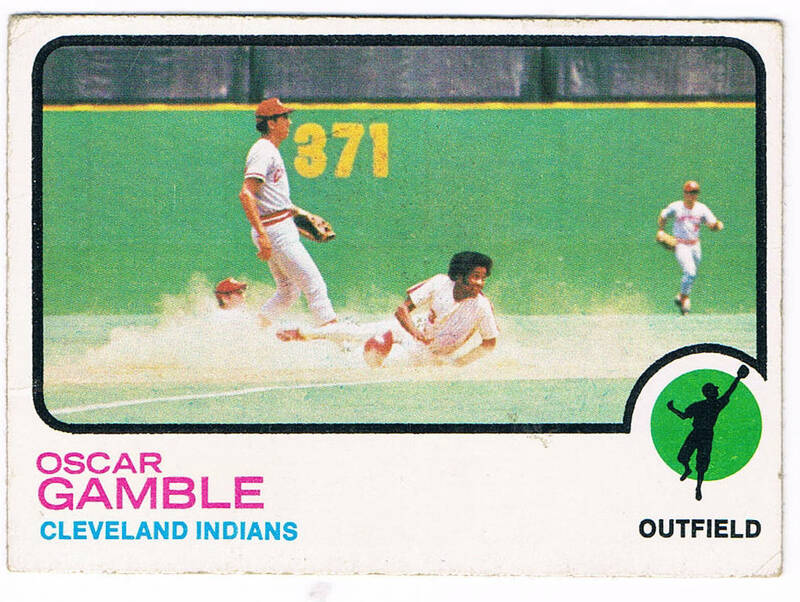 My own Oscar collection started at age 6, with this 1978 Topps card. I didn't know it then, but Topps' airbrushing of Oscar as a Padre standing in Yankee Stadium (note the BRUT billboard) just followed a pattern they'd established many years before. Bonus photo: another padre in Yankee Stadium. Pope Benedict's red boots required no airbrushing. They're real. Next came 1977 Topps, with Oscar airbrushed into a curiously black Yankee cap. What it lacks in afro, we get back double in sideburns. 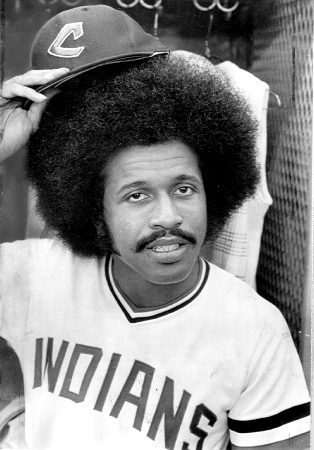 Next up, number three: Oscar as a funky Cleveland Indian. 1975's arguably a better card than the others on this page, given its strong pose, mustache/hair combo, smooth signature, and border colors. Night Owl doesn't see airbrushing here, but the cap's color contrast doesn't match Oscar's uniform, a giveaway that something's fishy. I suspect they retouched a real 1974 Indians hat to bring out the logo and bill. 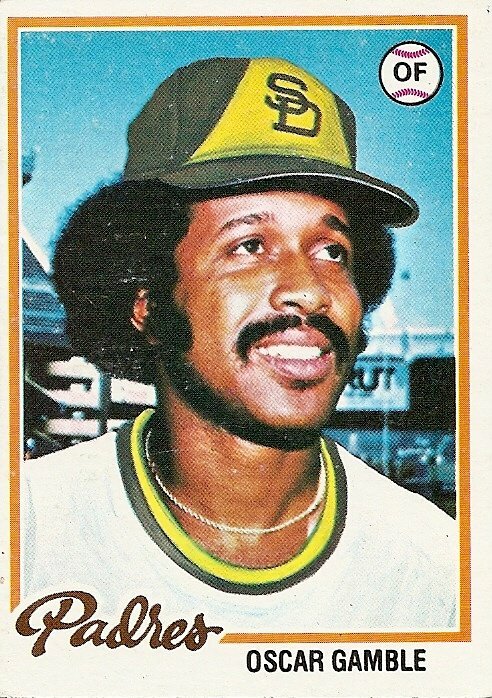 Some call 1976 Topps Traded an apex of airbrushing and others, the nadir. With due respect to Keats, I see its Oscar Gamble as Topps' own Ode To Grecian Formula and a classic among baseball cards. What were the artists trying to do with his shoulders? You'd get better physiology from three blind mice with paintbrushes. Also compare his hat brim to 1975's card. Both photos probably came from the same photo session. Finally, my personal favorite Oscar: this dusty traffic pileup on the Philly interstate between first and second base. Of all the 70s Gambles to take, I like this one best for its action shot and (finally) lack of airbrush work. Topps updated the team to reflect Oscar's off-season trade to Cleveland, but left him in this Philadelphia dust cloud with a bouncing hat and three Cincinnati Reds reacting to an umpire's call off-picture to the right. Based on its SS-2B-CF positioning, this is one of two plays from the regular season. Sat, June 4, bottom 1st: Gamble advances to 2B on infield single. They might've tried to force Oscar on a difficult play and the scorer credited Luzinski with a hit instead of a fielder's choice. SAFE. Tue, August 15, bottom 2nd: Gamble caught stealing C-2B, ending the inning. 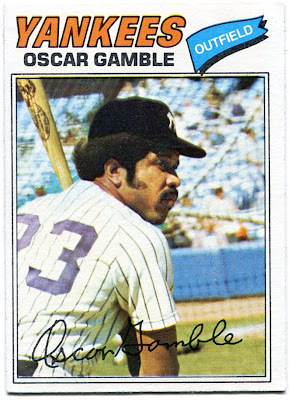 Oscar didn't steal often (he only attempted it once in 1972), so it could be a failed hit-and-run. This is probably what's shown on the 1973 card. OUT. Retired from the game but always dressed for success, Oscar Gamble. Hats off to him. Nobody rocks the hair like that anymore! Thanks Cliff, nice profile of Oscars and closing shot of Coco Crisp. Some hair just can't be ignored. Poll: Would you rather have Mantle or Wagner?